Super House of Dead Ninjas. 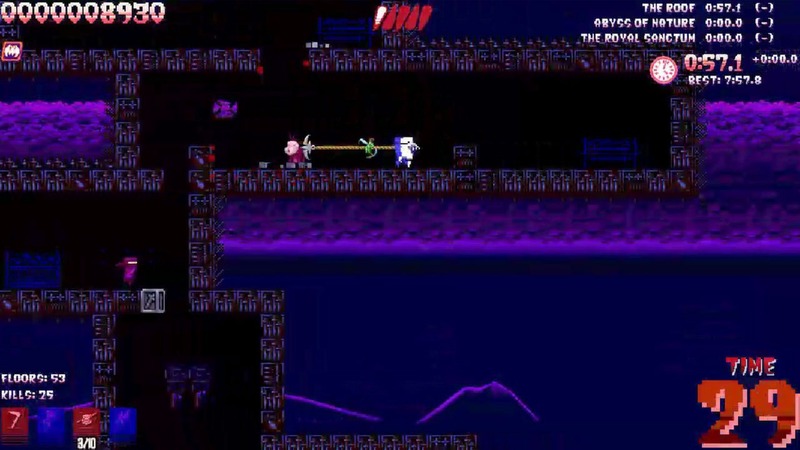 The awesomely named Super House of Dead Ninjas is a 2D platformer where you have to descend down a huge tower. When you start you get to chose your weapons, upgrades and other which is your appearance and items you can use, there are loads of different variations you can unlock but at the start you just have the default. You also chose your difficulty mode before playing, either normal or hard and where a bouts you start in the tower, you have to start from the very top if its your first time playing though. Once you actually start playing the game you’ll see a few things on the screen, a timer in the bottom right which if runs to zero you lose a life, this promotes quick gameplay having to find and collect extra time, if you die to an enemy it also restarts. In the bottom left is your weapons, you get 4 which are melee, range, explosive and magic, this can be changed before you start the game, your health is at the top middle of your screen. The gameplay is super quick and you can really run through at a rapid pace (If you’re good) with loads of different enemies to fight and to keep it fresh the levels are randomly generated. You get 3 retrys to complete the game and if you use them you have to start again so it’s a game you have to complete in one run through, unless you get to a floor that unlocks a different start point. The goal of the game is to get to floor 1 and kill the final boss, if you manage to do that you get loads of stats of how well you did which gives you incentive to try and do better, you will also unlock loads of new goodies you can use as well to mix it up. It goes into the Agon category because you have leaderboards where you can compete against your friends and you also compete against yourself to do better, so it is competitive, and it falls into mimicry because you are playing as a character. I’ve also put it into Illinx because you are going at super fast speeds which makes it a bit confusing where you are meant to go. I didn’t really get into flow whilst playing the Super House of Dead Ninjas, this is probably because I just wasn’t very good at it, I found it very difficult. I do think this is a good thing though because it adds longevity to the game, if I had to say what section of the flow diagram I was in I would say it was anxiety because my skill was very low and the challenge was very high. The next internet based I had a go on was Canabalt which is an endless side scrolling game where you try to get as far as you can and It’s available on loads of different platforms. It’s similar to games like Temple run and Jetpack joyride in the fact there is no way to actual complete the game it’s just continuous and high score based. 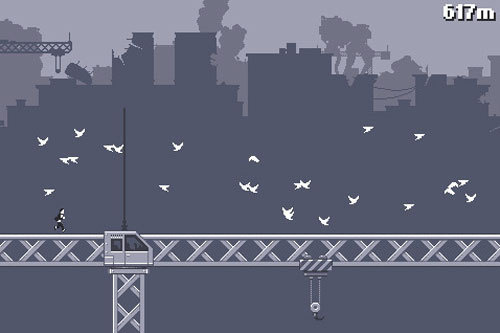 I think the game has a really nice art style and a highlight for me is just the simple way there are birds on roofs that fly away when you run through them, looks really cool. The controls and game in general are very simple really, in the top right hand corner it tells you how far you’ve got and that’s the only visual stat on the screen. The character automatically runs picking up speed the longer you’ve been running, and its ‘C’ or ‘X’ to jump from building to building. You get some obstacles in your path like chairs and barrels that slow you down, these are a hindrance and a help because if you hit one just before a jump you fall and its game over but if you are running too fast you can hit one on purpose to slow yourself down a bit. You also occasionally get a bomb crash down that if not avoided will kill you. For the game categories it falls into, they are Agon, Mimicry and Illinx. Agon because you get a score at the end of a run which is how far you have traveled, you can compare this with other players and try to beat them. Mimicry because you are playing as a character and Illinx because when you are running at really high speeds it gets a bit disorientating knowing when to jump or not. I wouldn’t say I achieved flow whilst playing I’d say I was more in a state of arousal on the flow diagram because I was okay at the game but not great and the challenge was very high. It’s a really fun game for how simple it is and makes you want to play more by trying to beat your own score and other peoples.